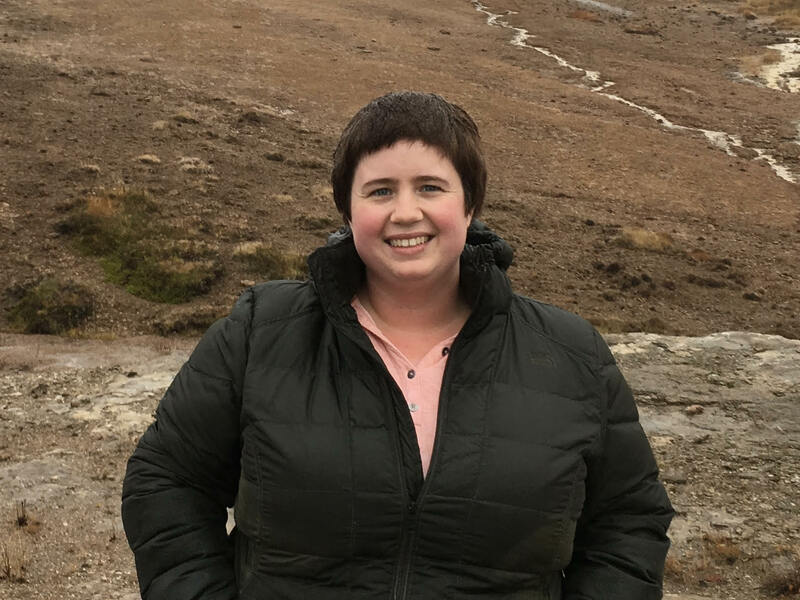 Sarah Olson is a medical library tech and aspiring writer from Minneapolis, MN. She is an advocate for better medical care for LGBTQIA people in her community and the broader medical community. She is a self-identified queer comic book geek, particularly those that feature marginalized voices. She is also passionate about embroidery, quirky dresses, experimental cooking, turtles, adventurous travel, hiking and literally anything that involves being in water. Prince Sebastian has a secret for years now he has enjoyed dressing in dresses, but he can’t keep stealing dresses from his mother and others in the palace. He decides to hire a dress maker, Frances, under the guise of being his personal tailor. With the help of Frances Sebastian has the courage to create a new identity for himself and go out in public as the fabulous Lady Crystallia. The dresses that Frances created become the talk of Paris and she wants to finally be able to live her dream as a fashion designer instead of hiding. 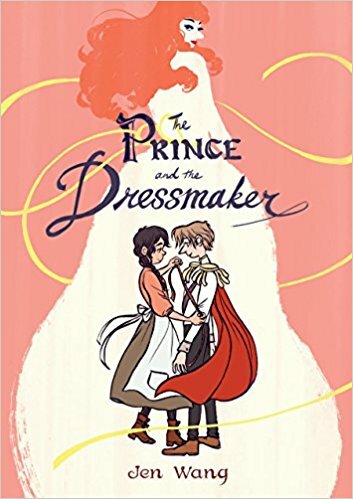 When the pressures of being a prince and expecting to conform to that role being to take his toll on him, he makes a mistake that could end up costing him everything. Hamal see’s ghosts, its just part of who he is and he hasn’t given it too much thought. Blue is a ghost that hangs out with Hamal, and has a bit of a crush on him, even though he doesn’t know how to tell him. When things in the afterlife start to become unsettled, Blue realizes that somehow Hamal’s powers are putting him in danger. When Blue is visited by a Reaper trying to find the reason for the disturbance in her realm, he realizes that in order to protect the Hamal, he might just have to leave him. These two are so cute and sweet with each other, and this comic does have a very adorably happy ending. These girls are the girl gang that everyone wishes they had. Mal, Molly, Jo, Ripley and April are the girls of Roanoke cabin at Miss Qiunzilla Thiskwin Penniquiqul Thistle Cumpet’s camp for hard-core lady-types. 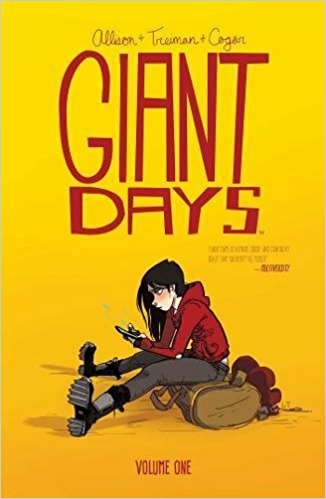 Mal and Molly have a sweet budding relationship, Jo is a trans girl with her best friend since forever April, and Ripley is the youngest and most energetic one of the group. They thought that they were going to have just a normal adventurous summer, but that gets turned on its head when they meet a shapeshifting bear-woman, supernatural critters and get in the middle of a feud between Greek Gods. This is Volume 1. Goldie wants to be a hotel detective more than anything else, while she isn’t there quite yet she makes due with pestering the hotel detective, Walter. When a necklace and guest go missing this case proves to be more complex for just Walter to solve he recruits Goldie to help. 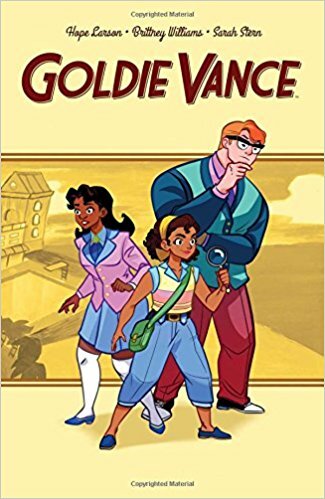 With Goldie, her best friend Cheryl and love interest Diane can they solve the case? The comic is set in the 1950’s and has fantastic women of color characters as well as queer characters, along with a great beach vibe of the 1950’s. This is Volume 1. 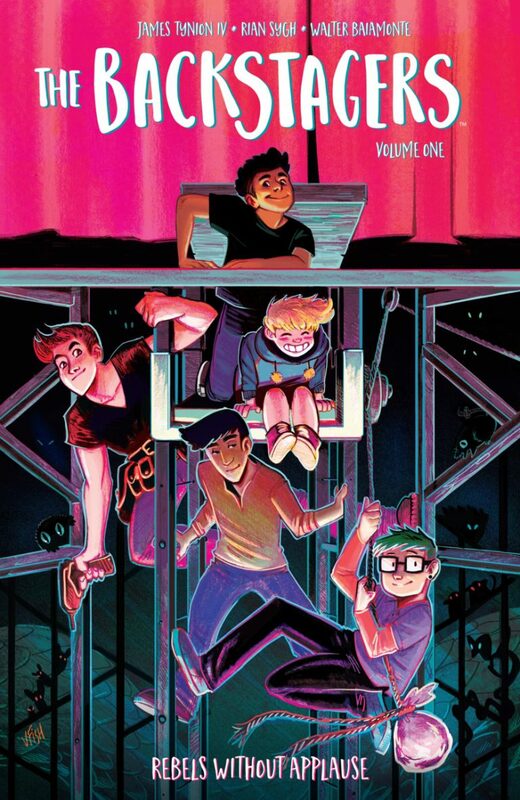 This is the comic about theater that I have wanted all my life, diverse cast of characters, unapologetically queer and completely magical. Jory is the new student and is trying to find a place where he fits in, he decides that theater is the only acceptable option. He finds that he is more at home in the odd background crew than with the actors onstage. The backstage is a magical world that is large on the inside than it is on the outside, a twisting maze of colors, giant spiders and mouse creatures. There is something else lurking back there though, something that has been there for a long time that wants to get out. This is volume 1. These girls, I love these girls, they feel like best friends you have known forever. Susan, Esther and Daisy just meet in university and have become fast friends. Daisy is the youngest of the group, formally homeschooled is a bit naive about university. Esther, my favorite goth, is trying to get over her high school boyfriend. Susan is a chain smoking medical student with some questionable cleaning habits. This volume goes through their first couple of months of months of University, first parties, getting sick on your own and finding love. This is Volume 1. 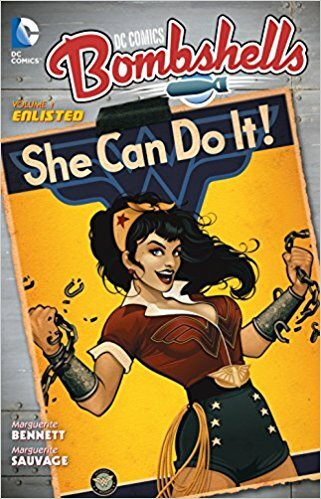 This is a complete rewrite of the beginning go DC Comics, set during World War II, nearly all of the superheroes are female and everyone is queer. The main focus of this volume is Wonder Woman, Batwoman and Super Girl, the “big three” of this universe. Wonder Woman, Diana, is brought into world war II when pilot Steve Trevor crash lands on her island of Themyscira. Batwoman, who is not stranger to fighting in wars, is working as a vigilante in Gotham when she is recruited by the government. Super Girl and her sister Stargirl are fighting for their homeland, Russia, as night witches. This is volume 1. 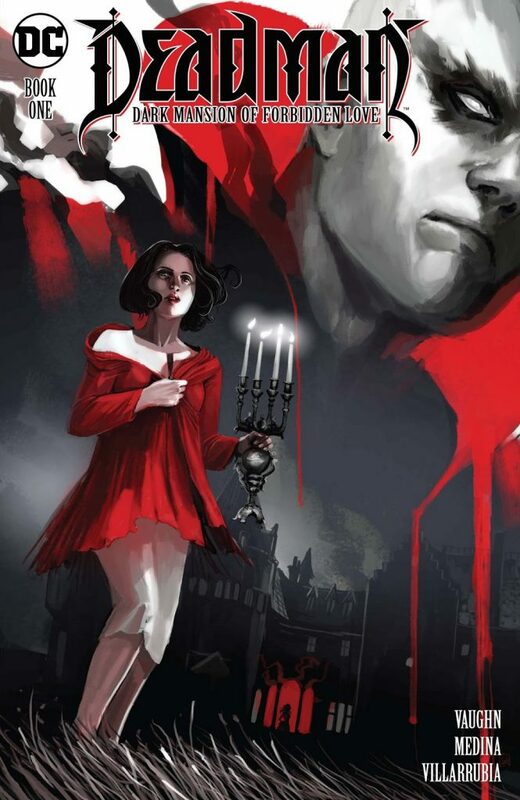 I love a good gothic mystery and this one is amazing. 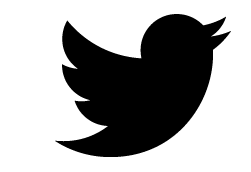 You have the old named manor house, murder, love and of course restless spirits. 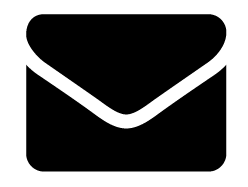 Berenice has moved to Glencourt manor with her boyfriend Nathan so that he can work on his novel, but he has become reclusive lately and completing of headaches. Berenice is connected to the spirit world and being have encounters with a vengeful ghost in her home. With the help of her friend Sam and Deadman (a superhero ghost) will she be able to find the cause of the haunting and stop it before it is too late to save herself. 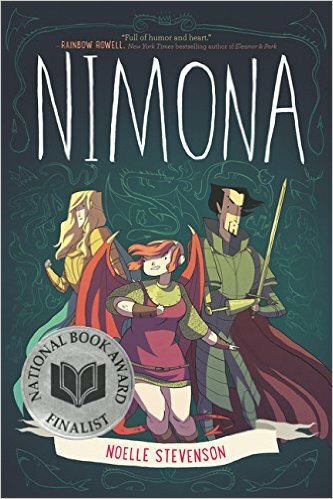 Nimona a blend of both science fiction and medieval fiction, there are knights and awesome science. Nimona is a shapeshifter and the sidekick of the kingdom villain Ballister Blackheart. Together they try and take down the the Institution of Law Enforcement and Herorics, and their hero Ambrosius Goldenloin. 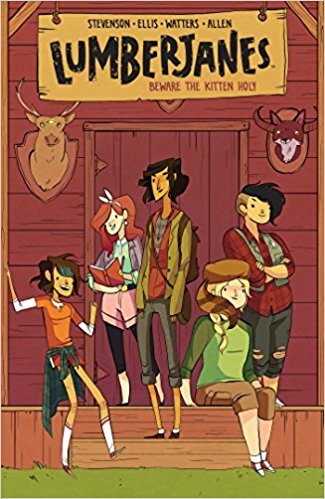 As their small acts of villainy become larger Ballister realizes that Nimona is much more powerful, and possibly dangerous than he knew, but he will do anything to protect her. 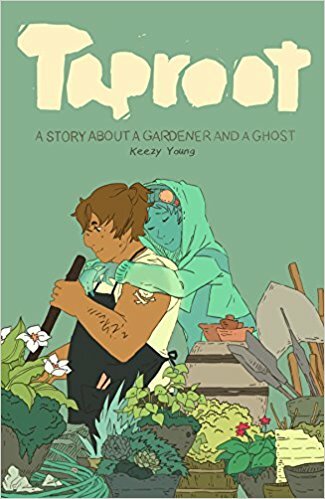 This is the first comic that I read with a powerful and fully realized lesbian character. 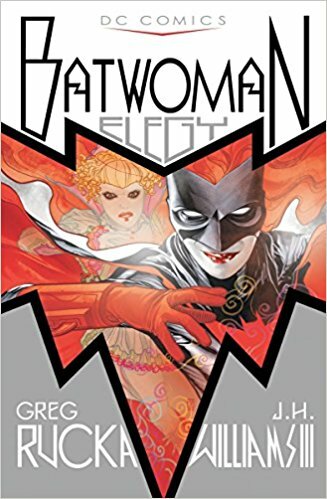 Batwoman, Kate Kane, is a vigilante hunting the streets of Gotham for answers about the death of her sister long ago. When she meets a villain named Alice she will soon realize that she has been lied to her whole life and that everything is about to change. Kate is also trying to protect both her secret identity and her girlfriend, police detective Maggie Sawyer, from each other. This is Volume 1.